"Photography is nothing," the great photojournalist Henri Cartier-Bresson once said. "It's life that interests me." This quote came back to me on first seeing Maciej Dakowicz's images from the series Cardiff After Dark, published as a monograph tomorrow. All human life is here, the gamut of exaggerated human emotion as it is played out each weekend on a few central streets and bars of the Welsh capital. As Polish-born photographer's epic study of Cardiff nightlife is published, the ink is as purple in the Observer as the air around Caroline Street is blue. 16. Billy (unreleased, 1984) The kind of song Prince could never officially release, Billy sounds how stoner-doom merchants Sleep or Earth might if they went funk, consisting of more than 50 minutes of guitar riffing accompanied by Prince repeating the gnomic statement: "Hey Billy, where d'you get those sunglasses?" There was a time, a time before cable. When the local anchorman reigned supreme. When people believed everything they heard on TV. This was an age when only men were allowed to read the news. And in San Diego, one anchorman was more man then the rest. His name was Ron Burgundy. He was like a god walking amongst mere mortals. He had a voice that could make a wolverine purr and suits so fine they made Sinatra look like a hobo. In other words, Ron Burgundy was the balls. We are on a three week winning streak at the Antelope's quiz night, but I was still woodshedding last night watching Anchorman which seems to come up in the film round more often than infinite dimensional analysis or quantum probability might suggest. I need all the help I can get. Even though we emerged victorious at the last clash, a point was squandered with the MC's laughable ruling that the African animal that kills the most people each year is the crocodile rather than the mosquito. When I called for a Stewards' enquiry, he suggested I bring a crocodile and a mosquito along next Monday, lock the door and see which kills the most patrons. A relaunch is planned for Myspace, which not so long ago, bestrode the narrow world like a Colossus. We petty men walked under its huge legs and peeped about as I recall. A timely warning against any hubris at Mark Zuckerberg's Facebook if nothing else. As for me, I'll never forget what's'isname. DIFF from BLOCK on Vimeo. Look down by there. You tells me. Would you really feel any pity if one of those dots stopped moving forever like? Hat tip - Steve Poole. Blogger has added the facility to use a title link back into its interface. Apparently I saved an entire penny by shopping with Saint Sainsbury's rather than grasping Tesco or the bread heads at Asda. That's my loyalty secured for all time then. Jonnie and the Bomber are both in the school team that will play Wimbledon College this afternoon. It's Jonnie's first competitive game and, in a pleasing turn of events, comes exactly seven years to the weekend since the two of them tried out Super Saturday Minnows Tag Rugby; see Icons passim. Wimbledon College being a Roman Catholic high school founded by the Society of Jesus in 1892, let's just hope that they don't get at the referee with any of that notorious Jesuit casuistry. I think we can all agree that the application of general principles of morality to definite and concrete cases of human activity, for the purpose, primarily, of determining what one ought to do, or ought not to do, or what one may do or leave undone as one pleases; and for the purpose, secondarily, of deciding whether and to what extent guilt or immunity from guilt follows on an action already posited has no place on the field of play since the special function of casuistry is to determine practically and in the concrete the presence or absence of a definite moral obligation, it does not fall within its scope to pass judgment on what would be more advisable, or on what may be recommended as a counsel of perfection. Rugby having laws rather than rules, as any fule kno. Our auction site has been in the Daily Mail again. The Burglar has pointed out that the headline above is fairly mild when you consider that the red tops have previously outed us as drug pushers and arms dealers as well as fences. We should be able to cope with any traffic that comes our way easily though, as the system is now running on the cloud via Amazon Web Services; pages are served from EC2, the database runs on RDS and images are stored in S3 to be specific. When we were moving it, we put a robots.txt in the root to stop Google trawling the test version. This worked well but when we forgot to delete it when we went live our Adsense income fell off a cliff. The money seems to be coming back now we have allowed indexing again which suggests that the Google's provision of context sensitive advertising is remarkably effective. New Wimbledon Theatre is delighted to announce the actress Priscilla Presley will be making her pantomime and London stage debut as The Wicked Queen in this year's pantomime Snow White and the Seven Dwarfs. Myself: The diacritic dot that commonly appears above the lowercase i and j in the Latin alphabet is called a tittle. Prodnose: You won the quiz again last night then? Myself: Well it wasn't just me. Sophie came up with tittle. There is no lowercase letter over which a diacritic dot commonly appears in the Latin alphabet in team you know. Prodnose: God give me strength. Yesterday was another terrible day. I behaved in a way to make a banshee look kind good and sweet. Insulting Elizabeth, drunk, periodically excusing myself rather shabbily and then starting the rough treatment all over again. Sometimes I am so much my father’s son that I give myself occasional creeps. He had the same gift for damaging with the tongue, he had the same temporary violence, he had the same fidelity to mam that I have to Elizabeth, he had the same smattering of scholarship, he had the same didactitism (bet I spelled that wrong), we wave the same admonitory finger at innocence when we know bloody well when we are guilt-ridden. I know South Walians are supposed to affirm that he forged the uncreated conscience of their race in the smithy of his soul but, just between ourselves, I have always found Richard Burton the most colossal boor. I'll grant that as an actor he was sufficiently schooled always to chew the scenery thoroughly before he swallowed, but is that really enough to sustain the legend? In his favour, however, as a self-loathing misanthropist (though sufficiently self-aggrandizing to find crowned heads hidebound and rivals rustic) he does appear to have been an entertainingly waspish diarist. I bought The Monarchy: A Critique of Britain's Favourite Fetish on kindle yesterday. It whiled away an agreeable hour or so. With the Queen’s Diamond Jubilee upon us, during a time of recession, high unemployment and national debt, Hitchens’ 10,000-word critique is even more relevant today than when it was first published in 1990. Part of the Brain Shots series, the pre-eminent source for high quality, short-form digital non-fiction. Vintage Brainshots (http://www.vintage-books.co.uk/books/Brainshots/) fills a hole I didn't know existed. The Bomber goes to http://www.tennisforfree.com/ of a Saturday morning. There was a sea of new faces there today and the car park was full. This is probably not unrelated to a certain Scot winning the US Open. Now I come to think about it, Judy Murray (Andy's Mum) is a patron who has even been spotted at the Joseph Hood Memorial playing fields in the past so it is all part of a virtuous circle. What if I have it as a combined Christmas and birthday present? It costs money because it saves money. Myself: Wales manager Chris Coleman said he was "embarrassed" by his side's "criminal" display in the 6-1 defeat by Serbia. I am abashed, blushing, chagrined, compunctious, contrite, crestfallen, debased, demeaned, discomfited, disconcerted, distraught, distressed, flustered, guilty, hesitant, humbled, humiliated, mortified, penitent, regretful, repentant, shamed, shamefaced, sheepish, and sorry. Detectives were called to Tooting Bec Common just after 8am amid reports that parts of a human body, believed to be that of a baby, had been discovered by park keepers.Scotland Yard confirmed officers were investigating how the “infant body parts” came to be in a council maintenance depot near Dr Johnson Ave, which splits the common. I use the car park in Dr Johnson Avenue when the Bomber goes to Tooting Athletic track. The grisly episode comes exactly a month after Stuart Hazell was arrested on suspicion of Tia Sharp's murder on the same ground where Ben did his summer rugby training. Sometimes the world really does look to me the way it must to the Daily Mail's editor. Life goes on I suppose. We won the quiz in Tooting (the same Tooting) last night for the first time in a while after going off the boil for a few weeks. It's an evening's investment in community social capital I suppose, bathetic as it seems in the circumstances so close to that horrible find at the Common. Is that gross or net? At the first training session of the new season yesterday the coaches redid last year's awards for the squad member's who couldn't make the event last May, so the Bomber got his Player of the Year Award for a second time. I recorded it on video on the iPhone and uploaded it (after much head scratching) to YouTube for posterity. I'm taking the Bomber to rugby this morning for the first weekend in the new season. Training is at the school rather than the club. I think is because cricket is still dragging on at the Poplar Road. I've just realised though, that this means I am giving him a lift to the same place he goes under his own steam from Monday to Friday which seems a bit odd. Maybe I'll have a rethink after I've sorted out all the 2012/13 membership and tour paperwork. Flicking through channels before I went our last night I found that you can get the Scrum V Welsh rugby coverage if you press the red button on BBC2 so I managed to watch the first half of the Cardiff Blues against Edinburgh prior to laying waste to SW19; "the nightlife is awakening". What passed for the commentary seemed simply to be a bloke called Rich O'Shea having a chat with his mates and responding to tweets. Dear Rick, I have got home late as I cut the tip of my finger off in work so I had to go to hospital. Now that you are a doctor can you explain to my girlfriend that it is still OK for me to go out for a few drinks with the lads. Rick duly obliged. I will obviously have to study this more closely so the wolf will not be down on the fold until after the PRO12 game finishes. Around nine on Fridays I imagine. 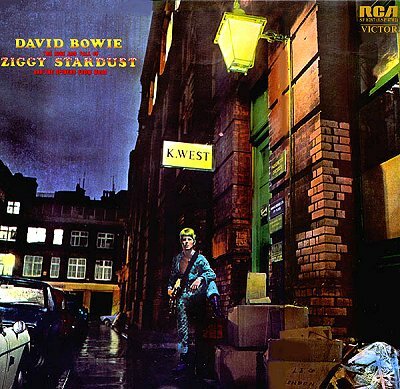 The V&A has just announced an exhibition, that will open in March, charting the career David Bowie, and last night I was having a drink in Heddon Street where the iconic cover photo for the album Ziggy Stardust was shot. How often are the planets in alignment like that eh? Mr. Spock: Captain, our tractor beam caught and crushed an air force plane. It'll be impossible to explain this as anything other than a genuine U.F.O. Possibly alien, definitely destructive. I'm hearing rumours that the immiment iPhone 5 may use a what seems to be a variation of the iPod click wheel for input. Apparently, the iDial, formerly codenamed the finger wheel, is circular with ten finger holes in a partial ring near the perimeter. 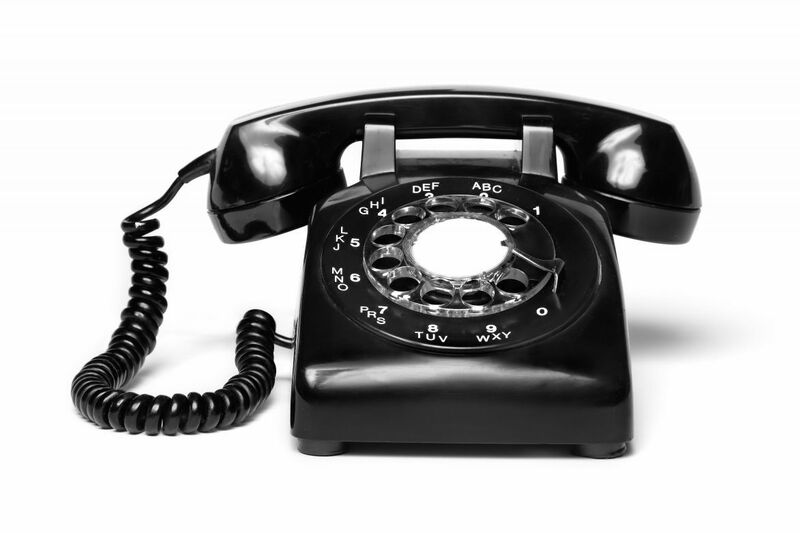 Unnamed sources indicate it is mounted via a shaft extending from inside the telephone and sits approximately 1⁄4 in (6 mm) above a faceplate which is is printed with letters and numbers corresponding to - and visible through - each finger hole. Ben and Jonnie; first year in primary school to first day in secondary. It couldn't be less like Hal David, but I think this is a great record. I was sorry to hear that Hal David has died. He was indeed a great lyricist. But a song is not a poem or (Golden Rule reference notwithstanding) an essay; add a harmonically rich, modulating Bacharach tune and you have magic. We're back from the Richmond to Windsor bike ride. I am as sober as a judge because I could never manage to catch up with the Bomber to ask him to stop at the pub whenever a pit stop was scheduled. We took his new bike. The front brake fell off just after I adjusted it with my treasured all purpose cycling tool and when we did stop I couldn't work out how to detach the new D-lock from its fitting on the frame so we couldn't use it to bolt the bike to a fence while we took five. 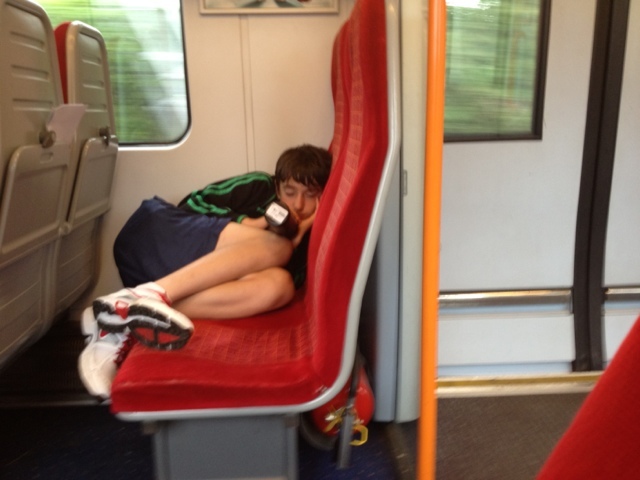 He fell asleep on the train on the way back as you can see. We enacted the secular right of passage that is the sock merge this week, now that the Bomber's size eight feet and close enough to my nines to make separating foot wear in the laundry more trouble that it's worth. That is all well and good, but setting up the bikes for tomorrow's Richmond to Windsor ride I have noticed that his saddle is now higher than mine. I am less happy about that. I have no intention whatsoever comparing the other measurement you may be wondering about.